The jit.gl.isosurf object creates a geometric surface from a volumetric density field. The polygonization occurs at locations where the density values intersect the edges of cells inside a subdivided cartesian grid. The subdivided grid can be made of either cubes or tetrahedrons, each of which will produce different types of geometric artifacts which may result in a surface which is comparitively better or worse depending on the volume dataset being used. 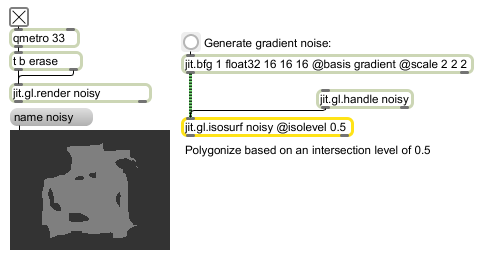 The jit.gl.isosurf object requires one argument: the name of a drawing context. A named drawing context is a named instance of a jit.window, jit.pwindow, or jit.matrix object that has an instance of the jit.gl.render object associated with it. This value may also be set via the OB3D drawto attribute. autonormals int Enables or disables the calculation of normal directions used for calculating lighting (default = 1).